Gilt tower mark to all pieces. Each piece painted on a deep blue ground with pastoral figures and huntsmen in pastoral and park landscapes within gilt trellis cartouches interspersed with gilt butterflies, with the accolée Arms of Charles Francois, Comte de Lannoy et de Wattignies and Alexandrine Charlotte Marie de Hangouart, Baronne d’Avelin. This ecuelle, cover and stand represent the highest achievement of the finest period of the Tournai porcelain factory and is perhaps the most ambitious piece of this period recorded. 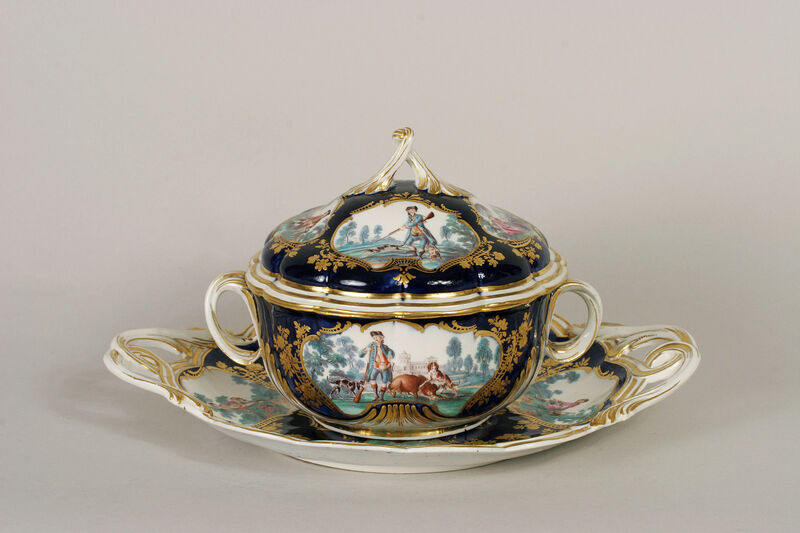 Of particular relevance, from an English perspective, is the connection with Chelsea porcelain and the painter, Henri-Joseph Duvivier, the most able painter who worked at both these factories. The elaborate accolée Arms of Charles Francois, Comte de Lannoy et de Wattignies and Alexandrine Charlotte Marie de Hangouart, Baronne d’Avelin help to date the piece as it was probably made to celebrate their marriage in Lille on 28th March 1762. This is consistent with what is known of the date of arrival Henri-Joseph and Michel-Joseph Duvivier in Tournai from Chelsea. There has been much confusion surrounding the identities of the different painters named Duvivier and the question of which ones were related. This has been complicated by the fact that many of the original Tournai factory records were destroyed during WWII; the most recent and most comprehensive study is by Charlotte Jacob-Hansen in the English Ceramic Circle Transactions, Vol.19, Part 3, 2007, ‘Deux-viviers, A Critical Re-appraisal of the Duvivier family tree’. This paper makes the case that that Joseph and Henri-Joseph, who have sometimes been thought to be different artists, are in fact the same person and that Michel-Joseph Duvivier was another painter. It seems most likely that these two painters, Henri-Joseph and Michel-Joseph, both worked at Chelsea and both came to Tournai around 1762/3 at a time when Chelsea’s fortunes were in decline due to the in health of the proprietor, Nicholas Sprimont. Since this ecuelle is unquestionably of the highest standard of painting produced at Tournai it is reasonable to suppose that it is by the premier peintre de la manufacture, Henri-Joseph Duvivier, and possible that the gilding was done by Michel-Joseph who ‘did the most expensive decoration in gold’. The style of decoration of a gilt cartouche in the form of a trellis against a dark blue, ‘Mazarin blue’ ground was popular at Chelsea in the early Gold-Anchor period, 1759-62, and was in turn taken from the style evolved at French Royal factory of Vincennes in around 1753/4 where this ground was known as bleu lapis. 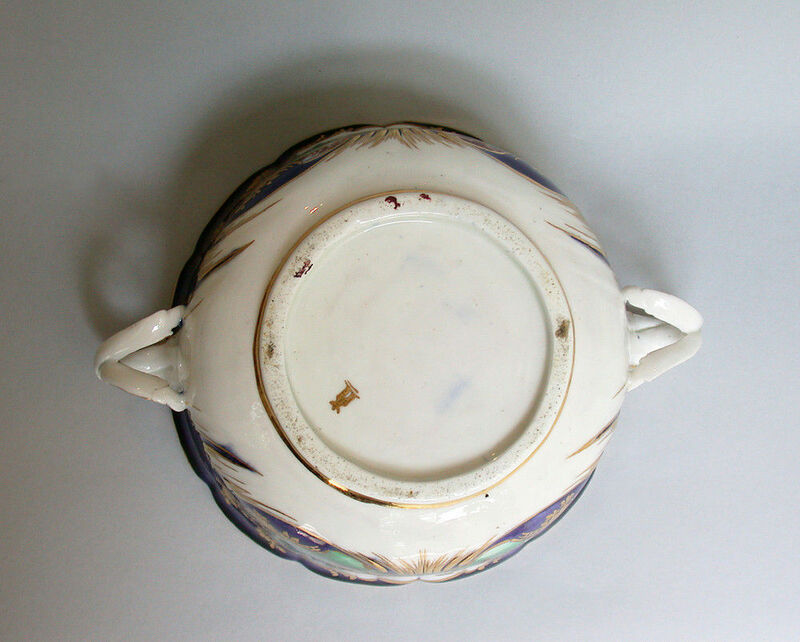 The treatment of the gilding, the use of ciselure and moths is nearly identical to that found on Chelsea porcelain, as is the highly finished polychrome painting. 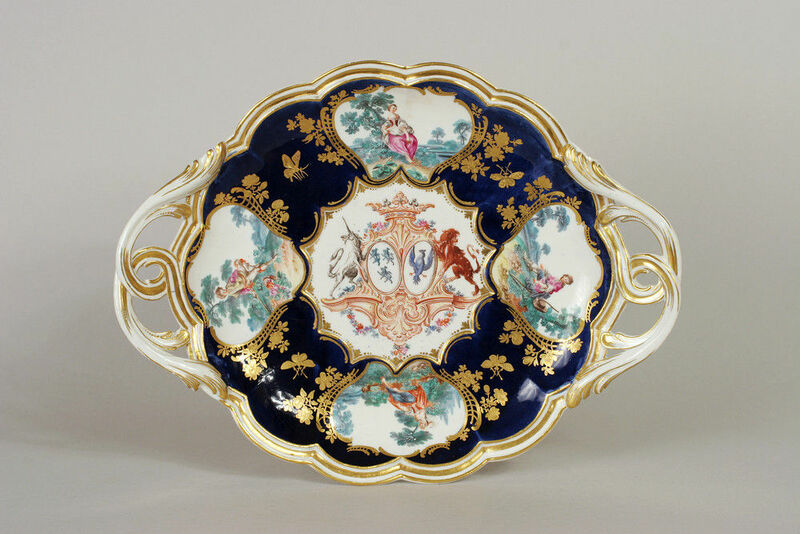 This ecuelle is a key piece linking the work of the finest decorators of English porcelain with that of Tournai; in particular its importance lies in the exceptional quality and that it is one of the very few examples that can be dated due to the known date of the marriage of the people represented in the armorials.